It was a perfect media storm, a contentious presidential election rife with ideological disputes and human drama at a moment when a powerful, new form of mass communication -- the pictorial press -- was itself captivating the public’s attention. At the epicenter of the action was the media-ready, ex-President Theodore Roosevelt once again seeking the presidency, although it meant running against his own chosen successor and one time friend, William Taft. When an angry Roosevelt was thwarted in his attempt to defeat Taft and party conservatives for the Republican nomination, he continued his quest for the presidency under the banner of the newly formed Progressive Party. Most of the attention in the resulting three-party race focused on the continuing battle between Roosevelt and Taft, but the ultimate winner was the much less colorful Democratic nominee Woodrow Wilson. All of this drama was perfect fodder for the pictorial press, the first in an ongoing succession of new modes of mass communication that have helped transform "news" into popular entertainment, picture ops, and sound bites. 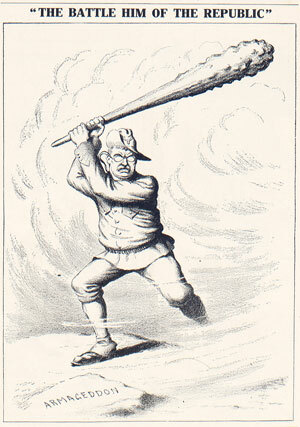 Especially prominent in the pictorial press were opinionated political cartoons that sometimes strove to educate but more often sought to incite, smear, aggrandize or simply entertain. While the art of the caricature goes back many centuries, its influence today is a by-product of the broad exposure it received with the rise of picture magazines and newspapers in the late 19th century. Talented political cartoonists were prized, fought over by rival publications, and cultivated by increasingly media conscious politicians. 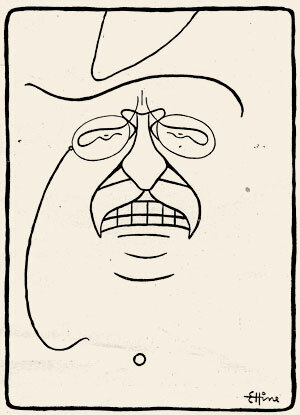 From the moment he entered into politics in the 1880s, Theodore Roosevelt was a favorite of cartoonists. With his trademark pince-nez glasses, large toothy mouth, talent for catchy phrases, and propensity for impulsive actions, he achieved cartoon stardom unmatched at the time. 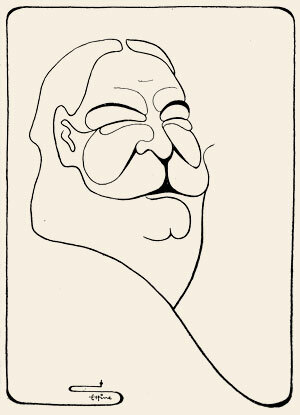 The slow moving, contemplative, 300-plus pound William Taft was his perfect cartoon foil, first discovered by cartoonists in 1908 when Roosevelt helped him win the presidency, and then again in 1912 when they battled each other. 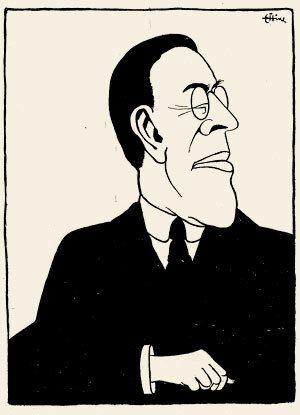 The cartoon persona of the newcomer Woodrow Wilson was less defined, but this served him well in an election that was mostly characterized by negativity and slander. The selection on display here is only a tiny sample of the tens of thousands of cartoons conspicuously featured on the covers, centerfolds and editorial pages of magazines and newspapers during the 1912 election. Back then, they affected perceptions and swayed votes; now they bring back forgotten artistic talents, and provide a lasting visual record of the personalities, issues and passions that obsessed the country one hundred years ago. 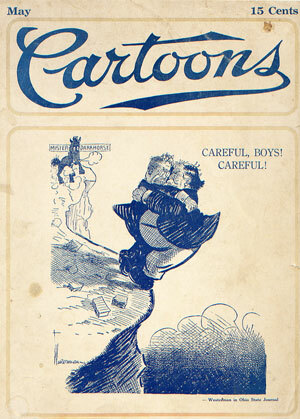 The very existence of Cartoons Magazine shows the great interest in cartoons at the turn of the last century. 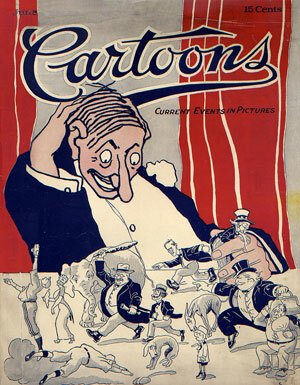 The magazine featured the "best" cartoons from other periodicals along with original articles about successful cartoonists. 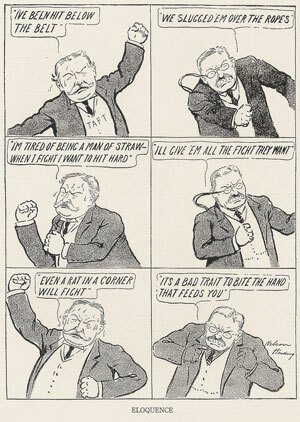 Harry Westerman's cartoon on the May cover portrays the election as a wrestling match between Roosevelt and Taft. The June cover, by an unidentified artist, celebrates the start of summer, the baseball season, and the upcoming selection of the presidential candidates at the political conventions. Hine's clever use of line illustrates how cartooning often paralleled the rise of modernism and abstraction in high art. These portraits are a good example of a more gentle type of celebrity caricature designed to catch the eye of readers without being particularly probing or excessively opinionated. "The Battle Him of the Republic" features Roosevelt's longtime identifying symbol, the Big Stick, and puns on "The Battle Hymn of the Republic," the Progressive Party's favored musical anthem. "Eloquence" quotes the heated rhetoric in the verbal battle between Roosevelt and Taft. 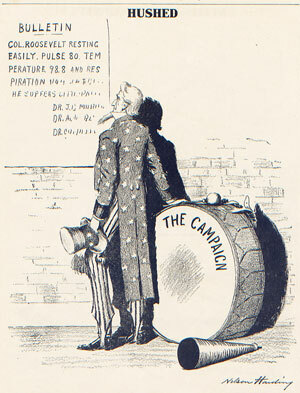 "Hushed" alludes to the suspension of campaigning during the final day of the election, after Roosevelt was seriously wounded in an assassination attempt.